I love this series that Sara has created…of all different shifters coming together and mating together. 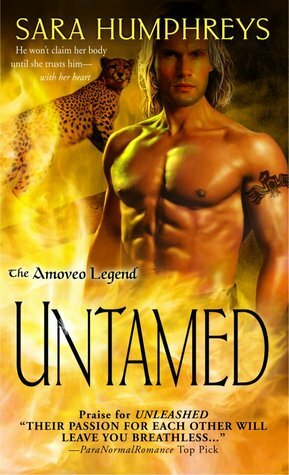 “Untamed” definitely had a lot going on with it, especially towards the end. Oh boy, that was a doozy ending. =) LOVED IT! Layla Nickelsen has always known she’s different. Her brother and sister are hybrids and have already shifted to their animal. Layla though has not shifted, except in her dreams. She is back home with her brother Rafie and the person who took her in as her own, Rosie. She’s trying to get away from the one person who she believes will try to control her and she happened to come upon him in New Orleans when she was doing a photo shoot down there. William has finally found his mate, and he will do anything to win her over, but he knows it’s not going to be easy. He’ll even walk away from Layla if that is what she wants, but he at least has to try. William is taken in by Layla’s family, although Rafie, Layla’s brother, is wary about William. Layla has never wanted fate to decide who her mate was going to be. She never understood that part of the Amoveo Legend, and it will take William everything to win her heart. In the meantime though, the Purists, the group of Amoveo’s that believe it is wrong to have hybrids (half shifter/half human). They want them all killed, and they are out to get Layla and the other hybrids. William will do everything in his power to protect Layla and her family. When Rosie, Layla’s guardian, gets hurt, William suspects the Purists are behind it, so he enlists the help of his friend’s Malcolm and Dante and also their mates. They are starting to suspect that there is a Purist among the council that rules over the Amoveos and they must find out who it is, so William can keep Layla safe and also Dante and Malcolm’s mates safe. Sara Humphreys did not disappoint. Now I want more after this book because it has a lot of unanswered questions. Ahhh!! I loved William when he was first introduced in the series, and I was so happy to see his usual mean self-become the lovable character that I knew he was. He just needed a female to knock him down some levels. Layla was difficult at first for me like, but I understood better on how she was when the truth finally came out about her Mom and Dad. This book brought on Civil War between the Purists and the shifters who support being with hybrids. I will not spoil the best parts though. You will have to read it to find out. I recommend this book to paranormal romance readers, shifter lovers, and fans of Sara Humphreys. Also…to people who have wanted to read Sara’s books for a while. What are you waiting for? “Untamed” is one book that had my heart racing and pounding due to all the excitement and of course I do not want to forget the steamy moments between two characters who were made for each other. =) I need a cold shower now. Looking forward to the fourth book next year and I need me some more Amoveo Legend Series.